Public speaking fear got you paralyzed? You CAN banish your nerves and actually enjoy your next presentation. 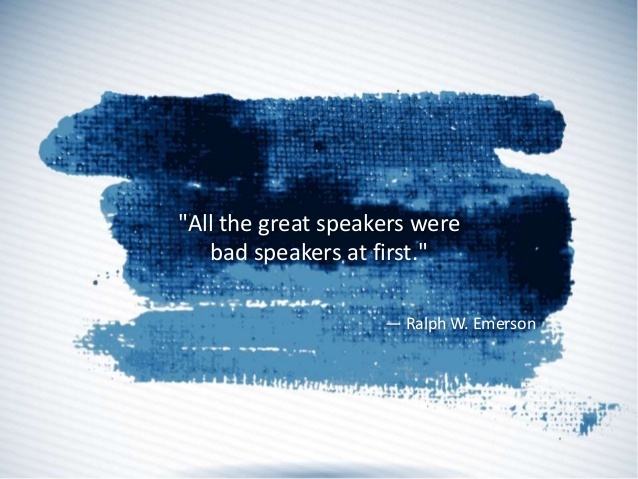 If you have a presentation coming up, start observing the traits and habits of successful public speakers. Take note of their styles and timing. How do they break the ice? What techniques do they use to engage the audience more? Looking your best will boost your confidence. Personal grooming is very important. How can people pay attention to your speech if all they can see is your messy hair or wrinkled shirt? When public speaking is required, make sure you look good, ready and professional. Sure you don’t mean any harm when you down a small bottle of whiskey to let go of all your inhibitions. But if you overdo it and you start rambling in front of the audience, that will be the end of it! Remember Mariah Carey when she delivered her acceptance speech at Palm Springs Film Festival? You don’t want to pull off anything like that! Negative thinking will not help you deliver your best speech. You need to start believing in yourself more. When you are confident about yourself, it will radiate in your speech. Confidence will make you appear more believable. We all make mistakes, but this does not mean you have to make it so obvious when you forget to read something off your notes. Nobody will ever know. It’s alright if you accidentally skip forward to the next image on the projector. Relax and carry on. with their speech as quickly as possible. If you are a fast talker, try to slow down and just enjoy every minute of your speech. No matter how good your material is, if the audience can hardly catch up, they would go home learning NOTHING. Always look at your audience when you’re speaking to them. And by audience it means people and not ceiling or floor. You will appear more confident when your head is up instead of having your face glued to your notes. Looking at your audience in the eye will also put them at ease. To prevent the audience from having a snooze fest, use graphics and different props. Keeping your audience entertained will keep the flow going. Use visuals if they can help you convey your message more effectively. Using humor will not only keep the audience interested but you are going to make a memorable speech. You don’t need to be a comedic genius like Ellen DeGeneres; just a few lighthearted comments will liven up the mood in the room. You can surely win your audience with well-timed clever remarks. If the president can do his State of the Union Address in one hour, why can’t you do the same? You can’t go on for hours talking about the same thing. Organize all your points and deliver them accordingly. Don’t torture your audience by having them listen to your ramblings all day. It is probably inconceivable to you that you could ever enjoy public speaking. I promise, it is possible. I've experienced this myself, and now presenting is one of the most rewarding things I do. Harness the power of your mind and feelings with Public Speaking Fear Hypnosis and start delivering great presentations today!